LG unveiled its new flagship V20 smartphone in New York on Tuesday evening, just 24 hours ahead of Apple's iPhone 7 event in San Francisco. 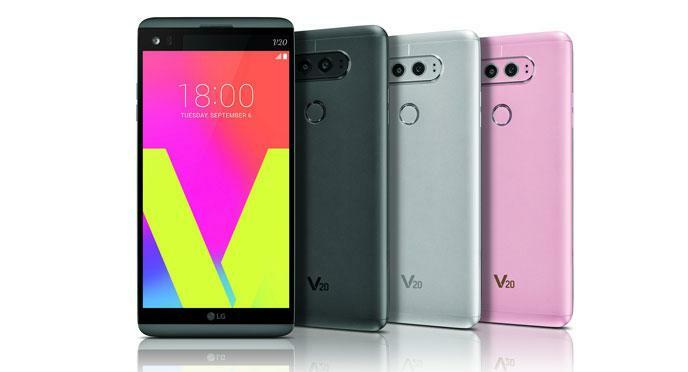 A successor to last year's LG V10, the new 5.7-inch phone is pitched as a "multimedia heavyweight" and boasts a Qualcomm Snapdragon 820 processor, 4GB of RAM, 64GB storage, a 2560x1440 QHD IPS LCD display, and a fingerprint sensor home button. The front of the handset boasts an always-on screen "ticker" strip along the top that can display mini apps and notifications, such as music controls and calendar events. The V20 sacrifices a unibody aluminum design in favor of a microSD slot (up to 2TB) and a removable 3200mAh battery via a metal backplate, while the top and bottom parts of the phone are made from silicon polycarbonate, earning the V20 a MIL-STD 810G drop and shock resistance rating. The device packs a USB-C port, water resistance is non-existent though. While Apple is expected to drop the headphone jack with the iPhone 7 series, LG is very much relying on the analog port to appeal to audiophiles: the V20 boasts a 32-bit Hi-Fi Quad DAC (digital-to-analog converter) and a 72-stage volume control fine-tuned by Bang & Olufsen, with support for most lossless music formats including FLAC and Apple Lossless. It also includes a HD audio recorder able to capture "studio quality audio" from three ultra-sensitive built-in microphones. The rear of the phone houses a 16-megapixel camera with a 75-degree field of view backed by optical image stabilization and laser, phase, and contrast autofocusing, with a second wide-angle 8-megapixel sensor boasting a larger 135-degree field of view. 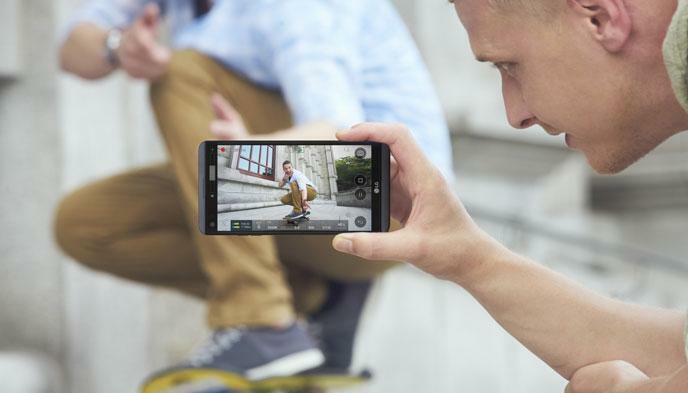 The front-facing 5-megapixel camera also packs a wide angle mode. Software-wise, the V20 is the first phone to come pre-installed with Android 7.0 Nougat, which features vertical split screen view, picture in picture, VR mode, file-based encryption, and more. With Samsung's Galaxy Note 7 suffering from a disastrous global recall due to reports of exploding batteries, LG's feature-packed V20 phablet finds itself first in line to go up against the iPhone 7 Plus, at least for now. While LG is yet to announce pricing and availability, consumers can expect the V20 to hover around the same $800 price point as the iPhone 7 Plus and Note 7. MacRumors will have full coverage of Apple's iPhone 7 event today, with a live blog on our front page at MacRumors.com and updates in 140 characters or less through our @MacRumorsLive account on Twitter. Anyone who says that a smartphone can take "studio quality recordings" without context cannot be taken seriously. Shame about the slow and sluggish operating system. No matter what hardware they throw at the operating system for me it won't be as fluid as iOS. For all those about to be hurt by the lack of a 3.5mm headphone jack. 10 years. 2005 vs 2015. Well, some people like Android and/or are invested in its ecosystem. That and SD card and 3.5mm jack. Wow, how can this cheap knock off phone have a 2TB SD card slot, dual camera with laser focus, better screen and a headphone jack while Apple has what again? Can't say they copied Apple because Apple has none of this! try the "LG experience", then report back. LG phone article on a site called MacRumors. Let's get a Windows phone story while we are at it! The LG phone and Android are direct competitors to iOS and the iPhone and has a direct correlation to what the readers of MacRumors are interested in. The site attracts a wide variety of readers with numerous interests and this is just one aspect of them. MicroSD, removable battery, headphone jack... WHAT YEAR IS IT? While LG is yet to announce pricing and availability, consumers can expect the V20 to hover around the same $800 price point as the iPhone 7 Plus and Note 7. Regardless, looks like a nice phone. Certainly will appeal more to a niche market. It's always good to have the option there if you want it.